Jim McEwan has really shaken up the whiskey world in his decade or so at Bruichladdich. Rocks is one of his new products, along with Peat, and Waves. Peat is smokey peat monster. Waves is buttery fat and sweet. 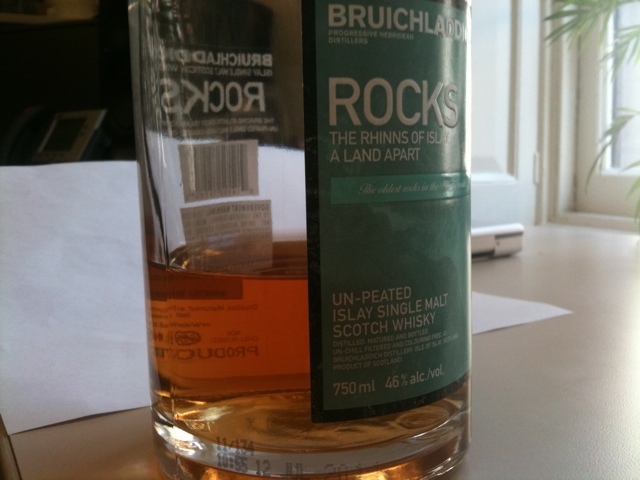 Rocks strides between and manages to be something unique and something, in my opinion, very true to the original aspect of Bruichladdich: a sweeter, fruitier, more harmonious take on briny iodiny smokey Islay malt. In the glass, Rocks is golden with a lovely peachy rosy glow. Rocks is aged for several months in French red wine casks which McEwan says accounts for the color. Aroma is delicate and dry with iodine, pork rind, dry oats, maritime brine, and a mineral tang. It smells like rocks on the sea shore. First sip shows a huge and unexpected (from the nose) explosion of honeyed cereal sugars with a midpalate expansion of oak vanilla, blackberry, and red fruits. The finish is long with smoky notes and anthracite char joining the honeyed cereal sugar red fruit medley with some oak resin tannins unfolding at the very end. It's a beguiling flavor profile, reminiscent of the Port Charlotte PC6-8 monsters, but less intense (and minus the peat), less proof, and far less expensive. It captures a measure of their intensity of flavor and maritime brine meets honeyed malt splendor. There's no age on Rocks' label. McEwan says its a blend of young single malts ranging from 6-9 years old. That's another way it's like the Port Charlotte offerings. Glad you switched up your comment settings so now I can comment on your posts! I recently picked up Rocks and already wrote my review (although I haven't posted it yet). The cereal notes are spot on. I would even go a step further and say that Rocks tastes a bit "bread-like". Very unique, but in a good way! Yes, bread-like. I agree. A couple of days ago I had it and noticed a dilute red wine note in the nose I hadn't noticed before - like a kiss of raspberry. The essential features for me are the gentle nose with iodine maritime flavors and the contrasting big cereal sweet flavor and robust structure in the mouth - and that kiss of coal combustion at the tail end. It just comes off as interesting, thought provoking, tasty and enjoyable. It strikes me as simultaneously fresh and new as well as classic and full of terroir. Bought some and agree, very maritimey. Like seaweed on octopus. Seaweed on octopus on the nose, perhaps. But on the tongue there is a massive attack of big malty sugars and nice big grainy body. It's a sea/land flavor combination. I think it's important to say that Rocks is unpeated. The coal combustion flavor note at the finish is coming out of the ingredients or the water - not peat from the malting. I think the absence of peat is part of why the cereal sugars are so big and bright on the opening. So very glad to hear that Rocks is a continuing proposition. It's a fine dram and a great value. has this a more juicy and barley sugared nature then 10? So Rocks is mouth filling too? I'm thinking Organic, Classic, Sherry Classic, Elements, and now Rocks. The "Laddie 10" is superior to Rocks in virtually every way and is well worth the extra money. Laddie 10 has a more lovely and effusive floral nose; a more honeyed entry; a more substantial mouth feel, and a richer presentation over all. However, I'm a great lover of Bruichladdich's new flavors and I find I'm quite satisfied by the odd thinner palate of Rocks which emphasizes the touch of wine, the bit of residual peat on the finish, and the sharp sugars of the young spirit on the opening. Rocks is certainly less of a quality product that Laddie 10 - but at 3/5th the price still and enjoyable dram (for me) and stands out as unusual at the price point. I state, for the record, that when I wrote this review of Rocks, Laddie 10 had not come out yet. As for the others, I haven't tried them all, but most are probably better than Rocks. That doesn't invalidate Rocks for me. It's a very young expression of Laddie - but one that lays clear the bones of the Laddie flavor profile. It's not the price too much. Have you notice Bruichladdich gets more refine after a month. Well I'm after one I can open and its like that. I've only had Resurrection. Then you should try The Laddie 10. It's more refined: floral, sweet, richer on the mid palate but still has that little kiss of anthracite on the finish. Just lovely. There's no wine finish on Laddie 10 - but it doesn't need it. It's quite a bit more expensive than Rocks, but it satisfies immediately, without the oxidation period.